Modern investment processes require the consumption of vast amounts of information from disparate datasets, including news, documents, financials, and your own data. Since these datasets are often living in different places, you might be incurring an accumulation of switching costs that is losing you hours of productivity per week. Sentieo’s new Dashboard aggregates relevant information across datasets so that you don’t miss key information or lose efficiency from switching contexts to find information. This new interface is comprised of widgets that you can customize to fit your workflow. Whether you are using Sentieo for documents, note-taking, financials, or alternative data, you will want to utilize your Dashboard. The Price Monitor helps you prioritize your portfolio down to your most important companies or tickers. In addition to providing prices and financials, the Price Monitor integrates your alternative data and custom thesis data for a truly cutting-edge process. For the first time, you can figure out which of your watchlist companies have upside to your own price target, which are trading cheap relative to historical multiples, and which show sentiment at all time highs! With so much information disseminated across documents, broker research, news, and tweets, it’s really easy to miss pieces of information that could impact your decision making. 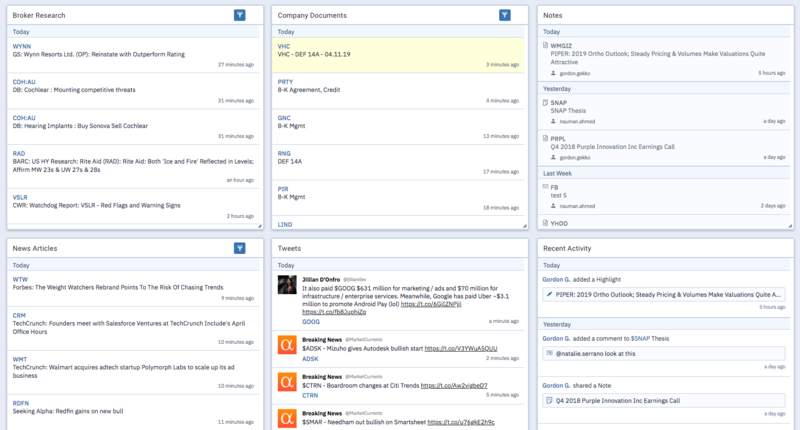 The Dashboard integrates all of these content sources so that you’re getting the best insights. Gain productivity by accessing the data (from multiple sources) that is most relevant to your entire portfolio. In addition to surfacing the new insights you find from accessing a broader range of data, you will also get back hours of time savings. Try out Sentieo today. Watch our Webinar all about Dashboard!